Watch the video to get an idea, then read the following information and check out the Festival FAQs. You may set up your tent site any time after 3 pm on Saturday. There will be a security guard on duty at the waterfront Saturday overnight, but items left at tent sites are left at your own risk. We offer prizes for the two Best Team Campsites. Get your spirit flowing and come up with your unique décor. 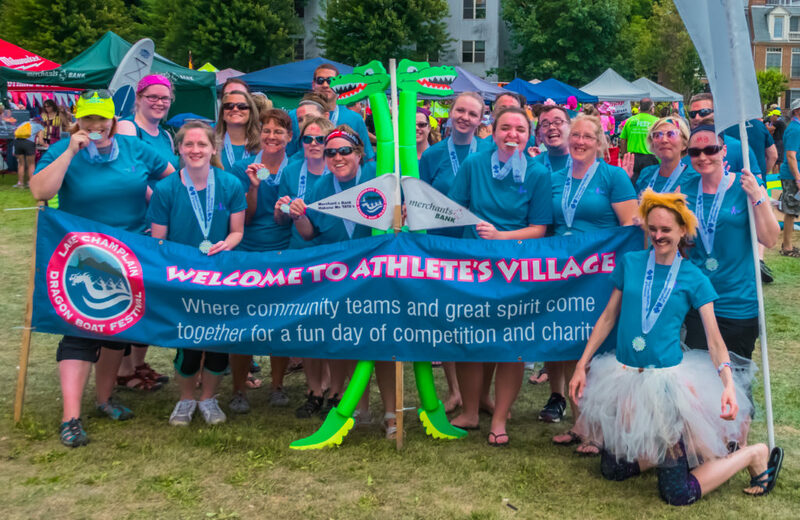 Check out the Athlete’s Village Map and Team Sites Listing the week before the Festival to see where your team will gather for all the fun and festivities. Your team should be at Registration at least one hour prior to your first race. Note: Plan to arrive at Waterfront Park at least 90 minutes prior to your first race to allow time to park and get to the festival site. You will also want time to set up your campsite as a gathering place for your team. At registration we will double-check that all waivers are in order, and team members will receive their race bands. All paddlers must wear a race band; it is how we know who belongs in the boats. Captains: If you have last-minute roster changes to make, you will be able to make them at Registration when you check in. It takes about 30 minutes to get your team warmed up and ready to race. You will need to listen to the Athletes Village PA system all day for the call to marshal for your races. First you’ll assemble in the the tents alongside the bike path. You’ll then head to warm up. Yee-Haaa! Next you get your equipment and line up on-deck in the tents by the Coast Guard. Then it’s time to load the boats and get ready to race your hearts out! Race Schedule: Your first race in the morning will be set in the race schedule. Your second race time will be determined by your time in this heat and your division placement and will be published at this web address (updated when we get closer to the festival) as well as on bulletin boards onsite. Subsequent races will be determined by whether or not you win later heats; results and schedules will be available in these same locations. Festival Schedule: There are many other activities occurring on festival grounds. Check the festival schedule for a comprehensive list and the festival map to find the location of various activities. If you have donations to turn in on Festival Day, please bring them to the Donation RV – the earlier the better, so that we can get them added to your team total. Be sure your team name appears on any checks and envelopes you turn in, so we can be sure to credit them to the right team. Thank you for supporting our cause – Dragonheart Vermont and Integrative Therapies at UVM Cancer Center. Of course you are welcome to bring your own food. Please be aware that grills are NOT allowed on Waterfront Park. The City of Burlington prohibits the consumption of alcohol at Waterfront Park outside of the confines of the Woodchuck Cider Tent. Capture the Fun of the Festival on Film! After your first heat, you’ll go to the Ride the Dragon photo booth to have your team portrait taken and perform your team chant/song for our Spirit Judges. Later in the day the photo booth will be available for people who would like to take their own pictures. Bring Home a Trophy! You can be in the Winners’ Circle! We have many chances to win shiny trophies all day long. Teams will be seeded into 8 divisions based on their first round times. The fastest teams will be Division A, the next fastest teams will be Division B, and so on. Teams race head-to-head and winners advance to the semi-final and final rounds. Winner of the final round earns the gold and the loser earns the silver. Eight Divisions. Eight Gold Medal winning teams. Eight Silver Medal runner-ups. Racing isn’t the only way to win, though! You can also vie for our Spirit Awards, or you could be this year’s top fund-raising team! On Practice Weekend we look after your watches, wallets, cameras, and backpacks for you. During the Festival there are simply too many people for us to be able to do that, so please be sure that someone is available to keep an eye on your valuables when you are not in your tent. We want everyone to have a terrific day on Sunday, and nothing puts a damper on fun like having your things go missing. Please make arrangements to be sure your personal items are secure. There are Lost and Found collections at both the Information/Volunteers booth and at the Information Table in the Athlete’s Village tent. We’ve got spirit, yes we do, we’ve got spirit, how ‘bout you?! We encourage your teams to participate and show your SPIRIT MAXIMA! So join the fun and let your SPIRIT SOAR! 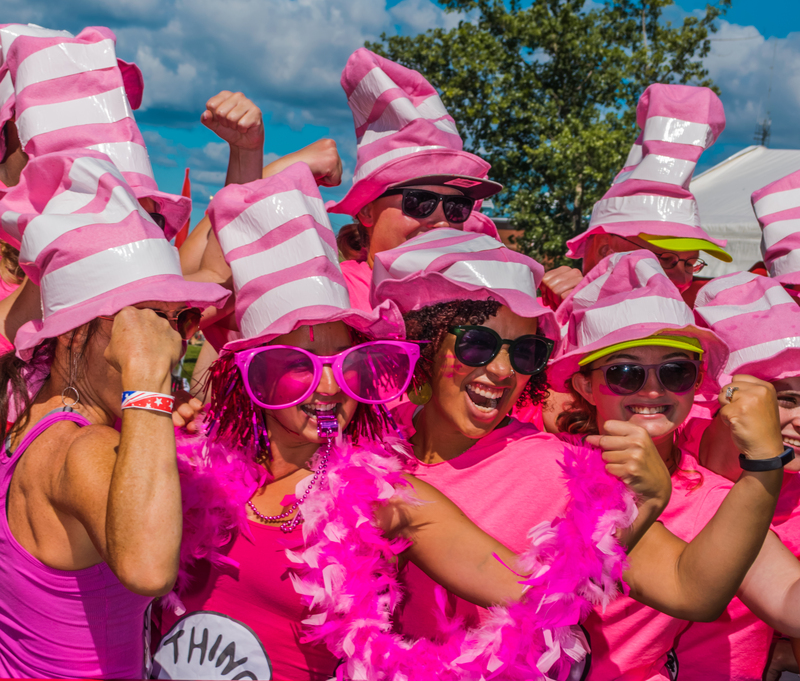 Between now and festival day, we encourage you all to get busy and write those special words, design those fantastic t-shirts, sew those banners, and plan those campsite decorations! 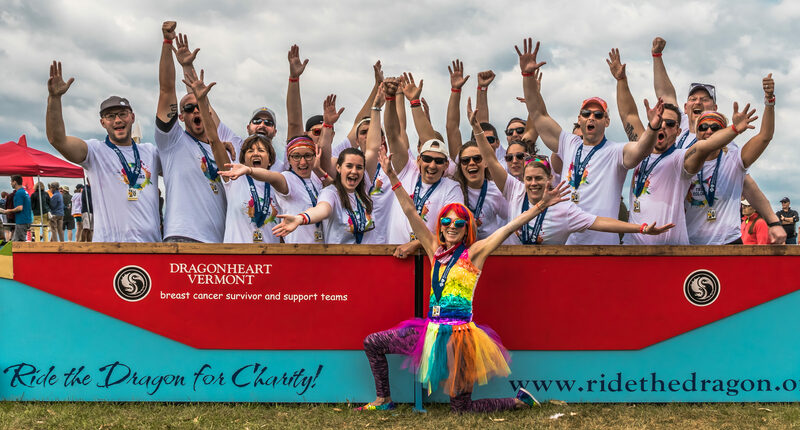 If your team chooses to design a t-shirt, consider printing one extra shirt to donate to Dragonheart Vermont. Drop t-shirts off at the Athletes’ Village Tent. We’ve made a quilt from t-shirts we’ve received in the past. Check it out in the Awards Tent and drop off your t-shirt to be added to the quilt.